When one hears cheap places to retire, most immediately think of sacrifice and doing without. Nothing could be further from the truth. The places we will talk about are not only desirable to live in they require less money to live. We have enjoyed all four "places". That sounds better than cheap doesn't it? The places we will talk about are fun and fulfilling...all it takes is a strong desire to retire and enjoy life. And one other thing, these cheap places to retire may float or have a steering wheel in the living room. Without a mortgage payment and less stuff in an RV vs a house...RV living is way cheaper than living in a house. If you like to travel, see new sights, meet new like-minded people, you can not beat the flexibility of fulltime RV living. 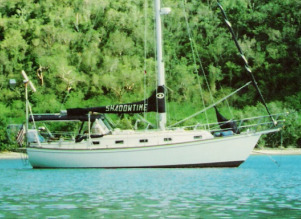 We lived in the Caribbean for 8 years on our 35 foot sailboat, Shadowtime. We lived on $1,000 a month...we never met anyone who felt sorry for us. When we were in a port with cruise ship passengers, they couldn't believe that when they were dressing for formal night we would be on own boat toasting our good fortune. Next week they would be back at work and we would be snorkeling the Tobago Keys. Think that is a "cheap" lifestyle? Think you can not buy a comfortable home for $15,000? You can buy a used park model all day long for $15,000...including furniture. Spend less than $1000 for a new floor and paint and you have a home in a park with more activities than time to do them. A summer camp for the over 55 set is what they will remind you of. They are so reasonable, many have two seasonal homes or a park model and an RV. If you will consider retiring overseas, you can enjoy a "traditional home" for a lot less than in the US. We are talking about living very well for $1,000 to $2,000 a month...A Social Security check for some. We have demonstrated so many lifestyles that do not cost a lot of money is almost impossible for someone to say they cannot afford to retire. The only exception that I can think of, is someone that has more than the $8000 average credit card debt the American family currently has, and those people have just made a choice to spend what they don't have. There you have four cheap places to retire...RV, sailboat, park model or overseas. We have done them all...without sacrifice. You can too. Return from cheap places to retire to guide to living cheap.